On 22 July, 2008 my son Keiren was involved in an accident. At 4.30pm on his way back from the local post office Keiren was run over by a semi-trailer at a pedestrian crossing in our town of Uralla (New South Wales). He was taken to our local hospital then sent via the lifesaving service of the Westpac Rescue Helicopter to Westmead Children’s Hospital in Sydney and straight in to surgery. His leg couldn’t be saved and it was amputated. Keiren was kept in an induced coma for four days and spent a total of ten days in an Intensive Care Unit (ICU) – his long journey to recovery had begun. At first we thought, “Oh my God! He’s only a little boy, how will he cope?” and “What will he do?” Many question were going through our minds, but then we realised “Okay, we can do this and we need to be grateful, at least he is still alive”. From the time we arrived at the hospital we received so much support from the staff and doctors. After spending 10 days in ICU, my son was moved to Clubbe Ward and eventually to Ronald McDonald House. Keiren had a great medical team around him, with his favourite being his Physiotherapist Natasha. Natasha and her team spent up to three hours each day with Keiren over eight weeks. The worst part of the recovery was the endless ‘never knowing’. During each medical panel meeting I hoped to hear “Yes, today is the day, Keiren is great, and you can go home”. Eventually they said it, but for a long time we were never sure what they were going to say. About eight weeks after the accident, Keiren came home and a different recovery began for him. He had to settle into everyday life, being an amputee. Although he had developed many skills in the hospital, he didn’t go home with a prosthesis and didn’t receive one until four months after the accident. He returned to school a changed person and had to adjust to life. Learning to use a prosthesis was testing, yet rewarding. It was great for Keiren to be able to walk again, without having to use crutches. He could join in more at school and didn’t need to use his wheelchair. The initial stages of getting used to his prosthesis meant that he had quite a few falls and broke his prosthetic leg three times before he learned to really use it properly. He now has a C-Leg that he feels really comfortable with. It has given him extra assurance and confidence when walking. He can’t wait to get a Genium knee, when it’s time. The family, the school and others were very supportive but they didn’t really understand the challenges he faced (and still faces) on a daily basis. As his main carer I could see him slipping into depression and was not coping. Keiren was diagnosed with Post Traumatic Stress Disorder (PTSD) and required counselling. This was a success and he was able to move past what had happened and began to heal physically, and mentally. In 2009, when Keiren was in Year 6, another event changed him forever. He participated in his school swimming carnival. This may seem insignificant to some, but to him it was a chance to feel normal again. 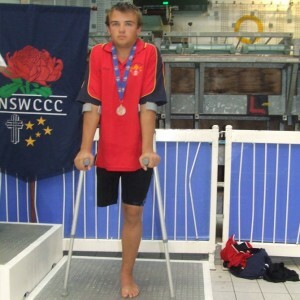 Now, five years on Keiren has become an Australian Champion in Swimming. Keiren has competed ten times at state level for his local club and school. This year he competed at the Georgina Hope Swimming Foundation championship and became a Bronze medal Australian champion in 50 meters Butterfly. I cannot say how much this sport has helped take a depressed little boy out of his shell and change him into a mature young man who lives and breathes swimming. One day he hopes to swim in the Olympics. He continues to push hard and improve his personal best times. Keiren also recently started an apprenticeship in spare parts and hopes to one day pursue his other love of cars as a career. The biggest challenged he faced recently was when he wanted to get his Learners Driver Licence. All the other little things that popped up along the way were nothing compared to a 16 year old boy who wants to get his Learner’s Permit! He discovered that it is as easy as it is for every other able bodied person. This became a very stressful time and sent him back into a depression. With persistence and determination he eventually got there. His car was converted with a left foot accelerator, and he’s very excited about getting his Provisional Licence in the next three months. As Keiren’s mother, my advice to other parents is to stay positive. We told Keiren “Yes, this has happened to you and it’s unfortunate, but you will be okay”. We reiterated to him that “There are other ways that we can do things. You have to face another challenge and keep going forward. Having an amputation or disability doesn’t define you – you are still you”. Keiren’s advice to his peers and their parents, is to “stay strong to who you are and don’t become the disability. You are you and always will be. Be positive and find people who accept you, for you. Be aware of the support that you have and can have as it can come from most unlikely places”.